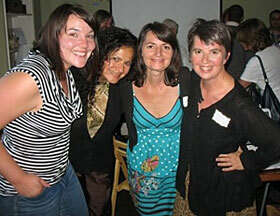 See Jane Do’s recent party with a purpose, a small town tweet up, demonstrated that big things can happen in a small town. It was standing room only at the Broad Street Bistro during the event and the participants in our rural community seemed just as excited and interested in connecting via social media sites as the attendees at the tweet up I attended in the city. The difference is that living in a small town where it seems everyone is separated by only two degrees or less, social change might occur at a much rapid place. Already there is talk of creating a Nevada County social media network where businesses, associations, non-profits and people can support each other. The next tweet up has been scheduled for July (hosted by the Briar Patch and Brenda Horton) and See Jane Do will incorporate a significant social media component at the next Ladyfest in the Fall 2009. Our hope is that following every See Jane Do program, communities across the nation will incorporate their own Soiree into Action. Perhaps our tweet up will inspire other small towns and rural communities to do the same. Thanks again to Marsha Lanier for an informative and engaging presentation, to Zuri at The Union and to all of you who participated in the event. Your support is greatly appreciated. Next So, What’s a Tweet Up?